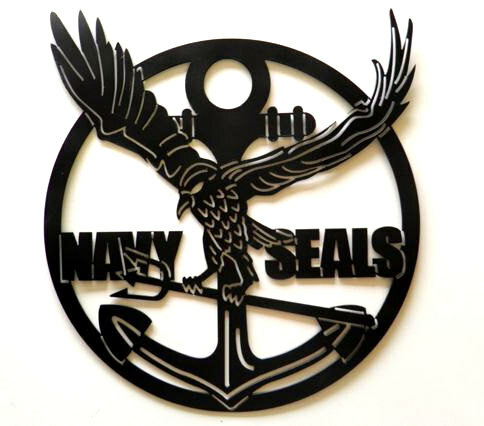 Above is a photo of a wrought iron hanging sign,with the emblem of USN SEALs, one of over 5000 signs and plaques on this website. This sign is a cut out of a silhouette of an eagle and an anchor. We precisely cut silhouette signs like these with our CNC plasma arcjet cutter, which is computer controlled. After cutting, the sign can be metal-coated with bronze, brass, copper, stainless steel, or rusty iron, or alternatively it can be painted in a variety of colors., Also, it can be sandblasted in some areas to produce contrast for features of the image. This plaque is 2D but we can also weld on overlays for a 2.5D (flat relief) look.. Please click on Product Gallery 7 to see other iron, bronze, brass, copper, gold, silver, stainless steel and aluminum plaques and signs. We make custom & personalized metal and metal-coated round, shield, and other irregular shape wooden wall plaques of animals, flowers, trees, scenes, logos, seals, emblems, for farms, ranches, residences and estates. We can make a 2D 9no relief), 2.5D (flat relief) or 3D sculptured relief (1 to 2 inch relief ) iron , aluminum or stainless steel sign or wall plaque of any design in any size from 12 inches to 14 feet, for either indoor or outdoor use. Metal coating types include bronze, brass, copper, nickel-silver, aluminum, stainless steel, iron, gold, and silver. Popular sizes are 24 inch, 36 inch, and 48 inch inch wide silhouette signs. We also make larger custom signs up to 14 ft width. .To get prices for the above or similar custom plaques at any size please call 951-698-8484 or email us at info@artsignworks.com; we will respond promptly. To see other signs for SEALs, the Navy and military , please view Photo Gallery 31(military plaques and signs), by clicking on the title of one of the numbered gray boxes on the lower left margin.